Valletta 2018 Foundation Chairman Jason Micallef with Form One students at St Ignatius College, Qormi. Discover Valletta is a series of brief narratives about locations in the capital city Valletta, available in audio format through MP3, a pack of flash cards and a map. The packs are being distributed to Form 1 students attending state, church and independent schools around Malta and Gozo. 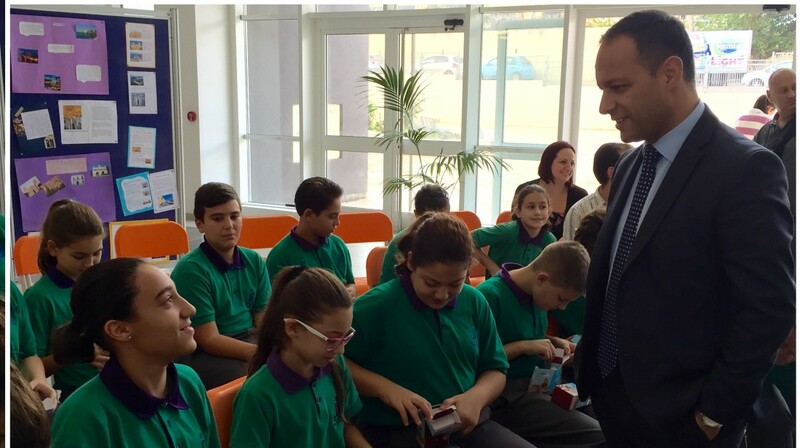 This was revealed during an event at St Ignatius Middle School in Ħandaq, where the second edition of Discover Valletta packs were presented to the Form 1 students. Present for the press conference were Mr Jason Micallef, Chairperson of Valletta 2018 Foundation and Mr Kenneth Farrugia, Chief Business Development Officer at Bank of Valletta. Addressing the students, Mr Jason Micallef explained that this project was launched for the first time last year and it received very positive feedback both by students and their teachers. “Discover Valletta, is delivering historical and cultural information in an interactive way since children listen to information about 24 sites in Valletta during school visits to the capital,” Jason Micallef noted. “Thousands of kits are being distributed to Form one pupils, every year up to 2018”. The Discover Valletta pack includes an MP3 player, loaded with 24 bi-lingual audio tracks. Every track tells the story of a different location in Valletta. There is also a flashcard that provides fun and educational information about every location. A map of Valletta linking the different locations and tracks is also included in the pack. Students will be able to retain the pack, so that they can revisit Valletta and share their experience with their family.